Will you be the first to catch the Golden Snitch? 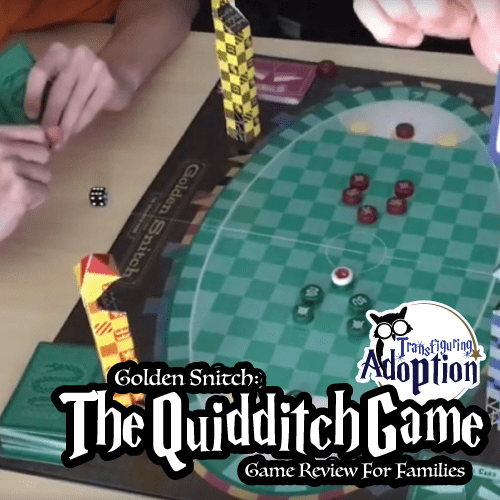 It’s Gryffindor vs. Slytherin in this fast-paced wizarding game of Quidditch. 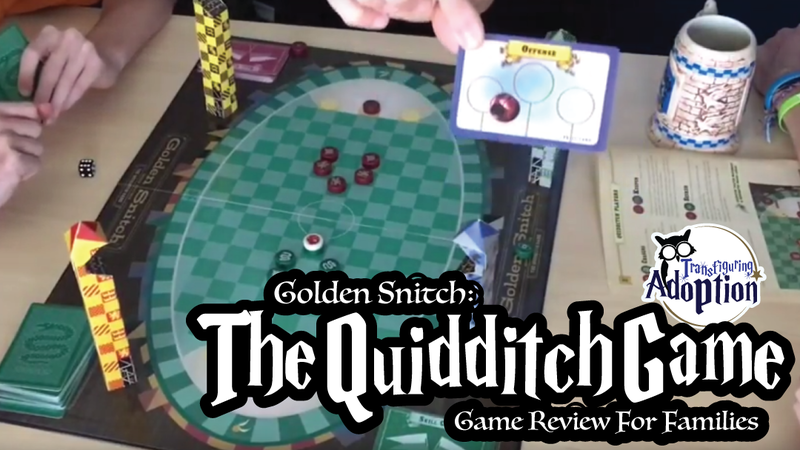 Outmaneuver the opposing team with authentic Quidditch tactics. Use the spells and potions to confound and outwit your opponent. Each high-flying game is a battle of strategy and magic! Our family purchased Golden Snitch: The Quidditch Game while visiting the Wizarding World of Harry Potter at Universal Studios in Orlando. As you can see from our review video, the game has several pieces and the basis of the game is similar to chess with other rules thrown in to make the game even more interesting. The few times our family has played the game thus far, the game cards and other aspects of the game appear to make the event as such that you never are quite sure who is going to win the game. This game will help your child work on their strategy skills. We will note that while the game box states that children ages 7+ will enjoy the game – children from traumatic backgrounds (such as foster or adoptive kids) may have a difficult time successfully playing this game until about age 10+ due to the complicated of the game play. Good video. Disappointed in the game because spells and potions are used. That is of course completely against what is in the books and movies. Not sure why game makers keep using magic attacks during a quidditch game. It’s true that there are alterations made for the board game. We found that the potions and spells allowed the gameplay to change quickly. I mean one person could seemingly be winning but one play of a card could make it the other person’s game. Thanks for watching Jason – let us know any other games we should review.